Affordable performanc­e! Best quality! Best price! Custom PC builds from entry level home use to the most demanding gamers & high end users. PC/Laptop repairs & upgrades, onsite services. Many years of system building experience ensures your PC will fit for the purpose straight out of the box. We believe every person requires a unique PC built to their needs and requirements and that's when our knowledge and expertise come into play. We will help you quickly decide on what's best for you! From entry level home PCs to water-cooled super computers, we can build to any specification. We use ONLY the highest quality brands and components while taking the greatest care in every system built to ensure an error-free PC and your experience with our systems is top class! We can build a computer to your exact specifications, meaning you are not paying for parts that you may not use. The computers that we create for you will be to industry standards and exactly tailored to your needs. We only use top quality components, for example, all our memory comes with a lifetime warranty! 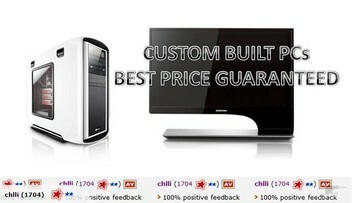 We also offer PC/laptop repair services at very affordable rates! Check out our feedback to see over 2500 happy customers! All emails are normally answered within 30 minutes. What a stunning build! It runs like a dream, butter smooth and mouse quiet, and it doesn’t even burp at complex repeating pattern designs. Seriously, well done. You have impressed us from first contact to final product, and we couldn’t be happier with your service, communication, and final product. I would not hesitate to recommend your services to anyone I know. Thanks again. thanks leo for seeing me over xmas time to build a pc. friendly and honest. recommended. I spent a lot of time looking around trying to find a PC with the specs I wanted, but failed to find anything that hit everything I needed. I wish I'd contacted Leo sooner, because all it took was a short email exchange where I told Leo what I was after, and the budget I had available, and he built me exactly what I was after. Really top notch service! Thanks Leo! I found Leo through TradeMe. After reading the reviews I was confident enough to give him a shot at designing my dream PC. My confidence was justified by the results. I absolutely love my new computer and couldn't be happier. Leo was an absolute pleasure to deal with throughout the whole process and I will definitely be back for my next build. Thanks again Leo! Leo just completed a custom build Ryzen project for me and I couldn't be happier. We needed everything blazing fast to handle constant video editing and we wanted someone to source specific components, manage the physical build as well as optimise the configuration with overclocking etc. His pricing was not only competitive, he also recommended ways for me to save money on the build and he even came out to my office to fit additional components. Thanks again Leo! Awesome trader first impression last, from his quick response on email, being honest on the phone, reliable upon receiving the item. Looking forward to do a business again with Leo he will suits your needs as a consumer. I am a newbie on computer equipment but I feel I am advance now because of the information that I learned from him. Thumbs up!! This was my first time buying a customised PC for my son so I had little knowledge. Leo was fantastic at communicating and was also super patient. Did an excellent fast job building PC. Would highly recommend!!! Thanks Leo. Leo provides superb service and quality products. Very helpful and friendly with extensive knowledge that means you get the very best computer system for your needs at an awesome price. Really appreciate all your help, just brilliant. Many thanks!! Thanks Leo for all your help with technical advice - highly recommended Trader. Leo has helped me out with my computer issues many times over the years. This week I had a hard drive failure on a notebook which was just out of warranty. Leo replaced the drive and reinstalled the software and got me running again at a price that could not be beaten. I can't recommend Leo and his workmanship highly enough. Thanks again Leo. Super Fast - Super Friendly. I just had 2 top end photo editing PC's made to spec and they have been perfect for all my needs. Leo is a great guy to work with. Fast communication and very helpful. I would highly recommend. Absolutely fantastic service, extremely friendly and helpful in all aspects. He listened and understood my requirements, went out of his way to meet me for the collection, and when I needed to return a bracket, not required, he didn't hesitate and promptly refunded me as quick as possible. Thanks again Leo, I will use and recommend your services to all. great service! very co-operative! leo knows best. Leo's service, prices, and product are 5 star, I did a lot of research for 2 years on my computer and can say that he chose the setup I wanted with total honesty as to my needs and the reasons for and against including certain components I asked about, I got the best deal that I could find on trademe or elsewhere. I had a problem at 7:45pm on friday night, Leo sorted me out and clearly informed me where I had gone wrong - that is what I call service, will be buying again recommend to all! Leo was great to deal with, some issues were discovered while testing my build and so Leo upgraded the motherboard to resolve these free of charge. I'm very happy with the purchase and service, highly recommended!